KEY CONCEPT: Recognising 2D shapes. 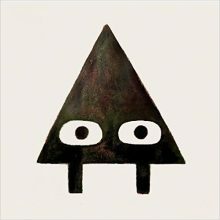 DESCRIPTION FROM THE PUBLISHER: Meet Triangle. He is going to play a sneaky trick on his friend, Square. Or so Triangle thinks… Visually stunning and full of wry humour, here is a perfectly-paced treat that flips the traditional concept book, and approaches it from a whole new angle.